The wheat and flour tests described in this section are standardized testing procedures commonly used for quality control purposes. Results from these tests have a direct relationship to finished product quality. Wheat and flour specifications are communications between buyers and sellers. These specifications are requirements for particular wheat and flour characteristics. To meet these specifications, wheat and flour quality testing is necessary. Specifications for moisture content, ash content, protein content, and falling number are determined with basic tests. Physical tests included in this blog are conducted to determine flour color and wheat kernel characteristics specified by wheat processors. The laboratory milling test is used to evaluate the milling performance of wheat and to produce flour for otherlaboratory tests. Wheat and flour specifications often require specialized testing to determine how flour will perform during processing. Several tests evaluate dough and gluten strength properties. The farinograph and mixograph tests measure the resistance of dough to mixing. The extensigraph test measures the resistance of dough to stretching. 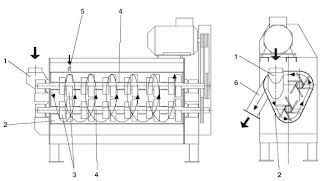 The alveograph test measures the resistance of a bubble of dough to expansion. The wet gluten test measures the amount of gluten protein in flour. The starch properties of flour are measured by the amylograph and the rapid visco analyzer tests.Section One is intended to provide information on wheat and flour quality tests used by the wheat industry worldwide to promote an orderly marketplace. Moisture content is determined by heating a flour or ground wheat. 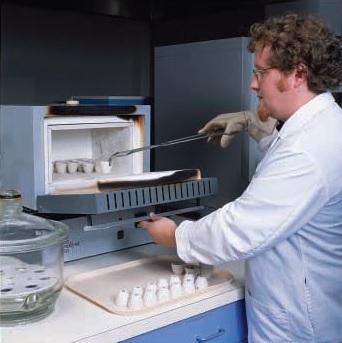 Sample in an air oven and comparing the weight of the sample before and after heating. The amount of weight loss is the moisture content. Moisture content results are expressed as a percentage. An example of a wheat moisture content is 12%. Determining moisture content is an essential first step in analyzing wheat or flour quality since this data is used for other tests. Flour millers adjust the moisture in wheat to a standard level before milling. 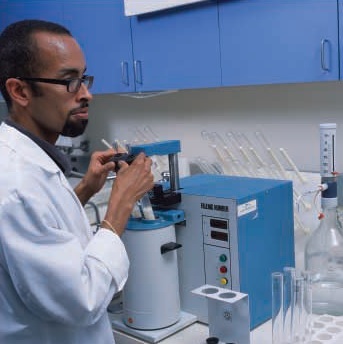 Moisture content of 14% is commonly used as a conversion factor for other tests in which the results are affected by moisture content. Moisture is also an indicator of grain storability.Wheat or flour with high moisture content (over 14.5%) attracts mold, bacteria, and insects, all of which cause deterioration during storage.Wheat or flour with low moisture content is more stable during storage. 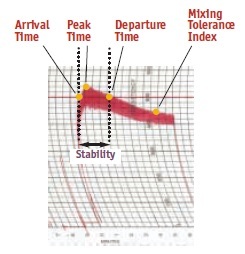 Moisture content can be an indicator of profitability in milling. Flour is sold by weight, grain is bought by weight, and water is added to reach the standard moisture level before milling. The more water added, the more weight and profitability gained from the wheat.Wheat with too low moisture, however, may require special equipment or processes before milling to reach the standard moisture level. Other methods of determining moisture content are used in the industry. For example, Federal Grain Inspection Service (FGIS) uses the GAC 2100 to measure moisture content of whole wheat kernels. Ash content is determined by high temperature incineration in an electric muffle furnace. When a sample is incinerated in an ash oven, the high temperature drives out the moisture and burns away all the organic materials (starch, protein, and oil), leaving only the ash. The residue (ash) is composed of the non-combustible, inorganic minerals that are concentrated in the bran layer. 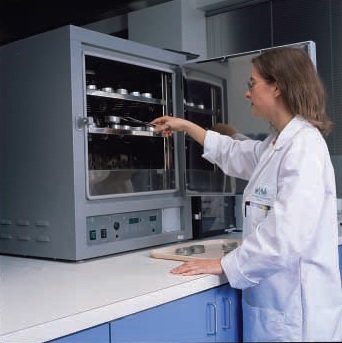 Ash content results for wheat or flour ash are expressed as a percentage of the initial sample weight; for example, wheat ash of 1.58% or flour ash of 0.52%. Wheat or flour ash is usually expressed on a common moisture basis of 14%. in flour can affect color, imparting a darker color to finished products. Some specialty products requiring particularly white flour call for low ash content while other products, such as whole wheat flour, have a high ash content. Protein content is determined through high temperature combustion in a protein analyzer. Since protein is the major wheat compound that contains nitrogen, the protein content can be determined by measuring the amount of nitrogen released during burning. Protein content results are expressed as a percentage of the total sample weight; for example, 10% protein content on 12% moisture basis for wheat or 8.5% on 14% moisture basis for flour. Protein content is a key specification for wheat and flour purchasers since it is related to many processing properties, such as water absorption and gluten strength. Protein content can also be related to finished product attributes, such as texture and appearance. Low protein content is desired for crisp or tender products, such as snacks or cakes. 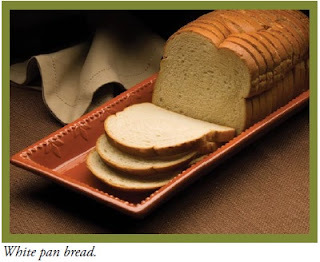 High protein content is desired for products with chewy texture, such as pan bread and hearth bread. Bakers use protein content results to anticipate water absorption and dough development time for processes and products, because higher protein content usually requires more water and a longer mixing time to achieve optimum dough consistency. Combustion Nitrogen Analysis (CNA) is often used to develop calibrations for other protein methods, such as Near Infrared Transmittance (NIRT) or Near Infrared Reflectance (NIRR). The falling number instrument analyzes viscosity by measuring the resistance of a flour and water paste to a falling stirrer. 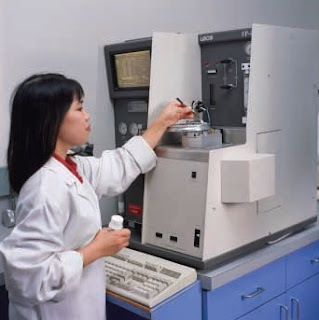 Falling number results are recorded as an index of enzyme activity in a wheat or flour sample and the results are expressed in time as seconds. A high falling number (for example, above 300 seconds) indicates minimal enzyme activity and sound quality wheat or flour. A low falling number (for example, below 250 seconds) indicates substantial enzyme activity and sprout-damaged wheat or flour. The level of enzyme activity measured by the Falling Number Test affects product quality. Yeast in bread dough, for example, requires sugars to develop properly and therefore needs some level of enzyme activity in the dough. Too much enzyme activity, however, means that too much sugar and too little starch are present. Since starch provides the supporting structure of bread, too much activity results in sticky dough during processing and poor texture in the finished product. If the falling number is too high, enzymes can be added to the flour in various ways to compensate. If the falling number is too low, enzymes cannot be removed from the flour or wheat, which results in a serious problem that makes the flour unusable.